For breakfast lovers, weekends are special when you can whip up something delicious like this sweet potato hash with eggs. Although it looks impressive, it’s really deceptively simple to make and cooks fast. Traditionally, a classic breakfast hash is made with regular potatoes with different mix-ins but I think you’ll agree that sweet potatoes are heavenly. 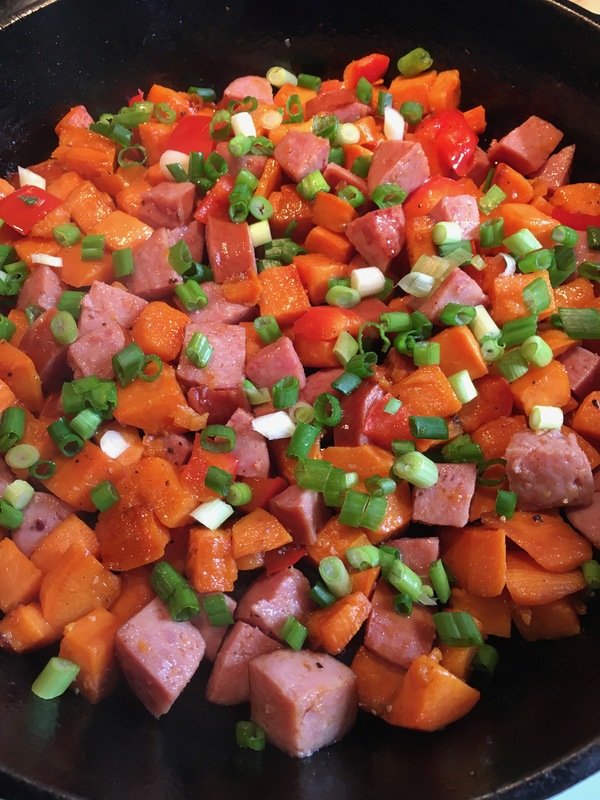 First, the sweet potatoes are cooked with red bell pepper, kielbasa sausage and green onion. Next, a subtle sprinkle of freshly grated fontina cheese takes this classic to another level. Then the top layer of eggs are slightly cooked under the broiler. Finally for garnish, chopped fresh chives adds the perfect topping. 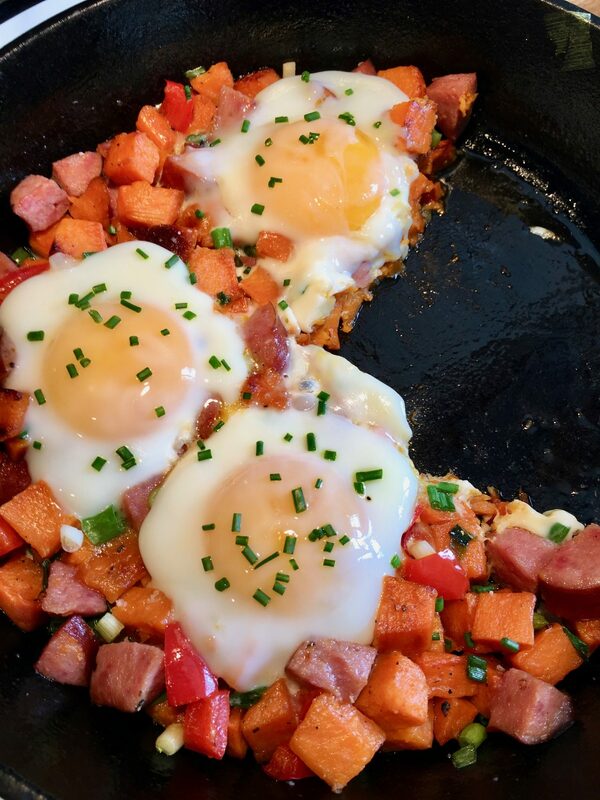 So whenever I have time in the mornings, this sweet potato hash is one of my favorites to make. Try it and I think you will love it. Preheat broiler on low with rack on the highest level. Meanwhile, heat olive oil in iron skillet on medium/high heat. 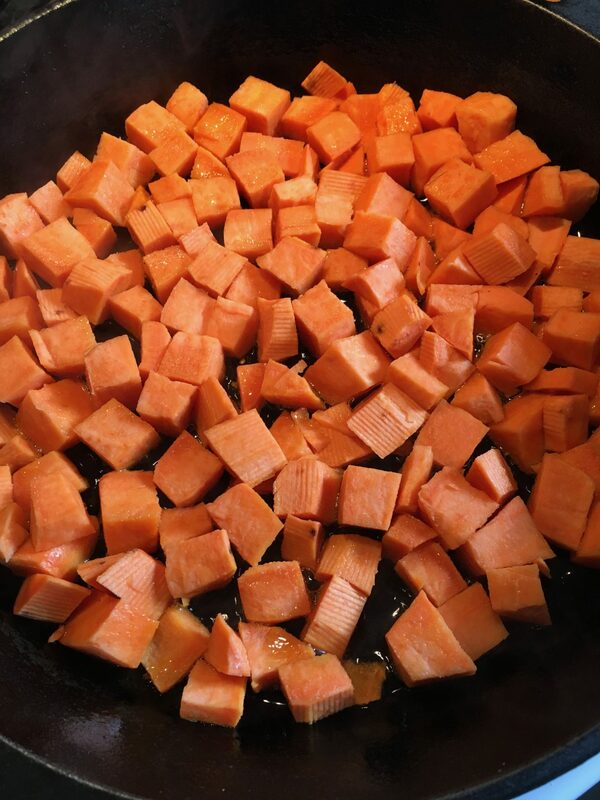 Cook sweet potatoes in skillet for 5 minutes. Turn it over. Add bell pepper and sausage. Let cook for another 5 minutes, stirring once. Turn down heat to medium. Stir in green onions and cook for 1 minute. Season very lightly with salt and freshly ground black pepper. (Easy on the salt, as the sausage and cheese will be salty). Sprinkle cheese on top. Arrange each egg on top. Season eggs with a little salt. Transfer skillet into the preheated broiler and cook for 5 minutes on low. When eggs are cooked, take out skillet and sprinkle eggs with chopped chives.